If you’ve ever wondered how to get views like this, you have to consider climbing to St Peter’s Dome in Rome, actually at the Vatican. Visiting St. Peter’s Basilica was always one of the top places I wanted to go in Rome. Truly it is magnificent. I could spend all day inside and in fact have gone back on a number of visits. 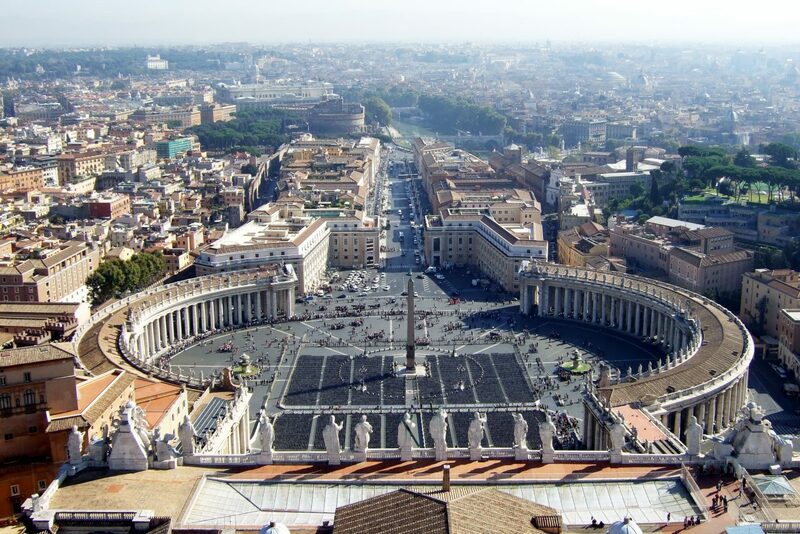 The other highlight of that is climbing to the top of the dome, or cupola, and seeing St Peter’s from inside the dome. From here you can either start climbing the spiral staircase to the top or take the steps down to the roof level. As you can see, the space is fairly narrow and steep. On the roof level you will find restrooms, a water fountain, a gift shop and a newly opened coffee bar, which was not here ten years ago when I made this climb. On your way, down you will emerge inside St Peter’s and this is one of the benefits of climbing the cupola prior to visiting St Peter’s Basilica, as you do not have to wait in the line again. Good luck! Have you ever made this climb? I’s love to hear your feedback, so please leave a comment. If you liked this story you may be interested in my stories as a solo traveler for 3 months in Italy. My award-winning memoir, Memoirs of a Solo Traveler – My Love Affair with Italy, is available on Amazon. Thanks for the photos, Margie. I climbed up many years ago without a camera! Yes, thanks. It’s funny how times have changed, but I do miss just enjoying the view without thinking about what angle I’m going to take it from. I think I will save this for a winter activity. I left a scallop shell up there from a beach in New Zealand as a gesture of my pilgrimage…it’s very special. Have you looked at older pictures of this view when the Borgo was still in place that Mussolini pulled down. Fascinating. Love your photos. Feels like I was there walking with you! Reminds me of “La Dolce Vita,” when the American actress character who visits Rome practically runs up the stairs at St. Peter’s since she is so excited to see the view. Thank you so much Kathy!!! I so appreciate your perspective. I’m going to have to watch that film again!! It’s been a while since I climbed the duomo of San Pietro. Definitely worth doing. I have a great foto of my up there age 11. I will have to dig it up! I always enjoy your posts, Margie. Thank you for sharing. This brought back some great memories as I climbed the dome last summer with my family. The tilt of the walls almost gave me vertigo, so I had to focus on the steps. The view proved well worth the effort (even if I had to utilize the rope at the top of the stairs)! I also find that once you’ve reached the top of any of these climbs in Italy, there is a huge sense of accomplishment!! Brava! !